Basic Hearth Loaf - Do You Know The Muffin Man? Notes: For the sponge, I used kamut flour as well as some stoneground whole wheat flour, and let it ferment overnight as recommended for the “ultimate full flavour”. Beranbaum addresses the issue of kneading dough on #4 speed with the Kitchenaid mixer (whose manual says to only use #2 for bread) here. While the machine wheezed and rocked, it was able to get through 7 minutes without overheating. When I was in Japan last summer, I bought a banneton that I haven't used until today. During the final proof, I transferred the dough into the basket which I dusted heavily with brown rice flour. 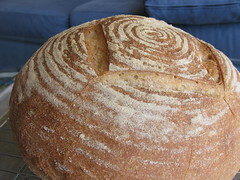 When the finished bread came out of the oven, it made loud crackling noises for a few minutes! 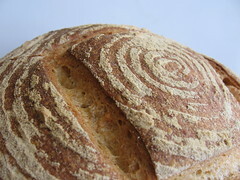 The crust is very crisp, very soft interior with a good flavour. Bread really should be eaten while it's fresh. Sifu Renka took a picture of a slice at the potluck. Here is Marie's loaf (she's the one that baked every recipe from this book! ).